I’ve been teaching for years that rational thought is not required in decisions that are often based largely on emotion. 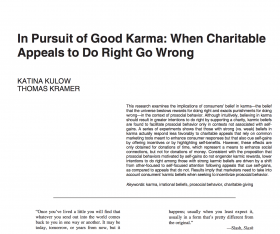 Recent research by Kulow and Kramer, “In Pursuit of Good Karma: When Charitable Appeals to Do Right Go Wrong” continues to support my theory. Study after study have shown that, although most Americans will not admit that they are irrational, their actual decisions on product purchase, value and price, even satisfaction, are closely tied to things like fate, superstition, karma, luck, etc. In this article, published in the May 2016 edition of the Journal of Consumer Research, Kulow and Kramer report that marketing appeals to those who believe in karma can produce prosocial behaviors but only if there are no anticipated self-gains. Regardless of the fact that a program might help more people if more volunteers get involved, if the appeal is directed at people who believe in karma and they sense that they are going to gain something by their participation, their willingness to participate goes down. Interestingly, these results go out the window when the researchers changed the question from volunteer or donation of time versus donation of money. I could spend a month on this topic and I encourage you to take some time, read the research and dig deeper into the references, but the overarching theme here is profound in terms of its relevance for you and your practice: people assume you are going to take great care of their child’s orthodontic needs. That’s the bare minimum for you to maintain your license. Only 15% of consumers will make a choice to start treatment with you versus a competitor based solely on price. The other 85% will choose you over a competitor and even choose higher-quality, more-expensive treatment if they understand the value proposition, a guarantee of satisfaction, they trust you and can justify your office’s ability to satisfy their real desires for convenience, comfort and being part of a “place” that feels like the lifestyle they want to embrace. There are deep undertones in these emotions for making a decision just as there are for those who believe in karma. Parents want to make the right decisions for their children. No amount of you talking about comparative superiority based on bracket type, manufacturer branding, even overall treatment options are as important or more important than how someone feels doing business with you. Even if everything says that logically they should choose you, if you fail to appeal to the emotional reasons why people make decisions, you’ll scratch your head forever, wondering why your competition has passed you by. That’s a writer-downer. Worked at Burleson Orthodontics. Attended University of Missouri–Kansas City. Lives in Kansas City, Missouri. Why Smile Direct is One of the Best Things That Has Happened to Orthodontics. Dr. Burleson on What They Want. Dr. Burleson on Perseverance of Beliefs. David Allen on Perseverance of Beliefs. Rick on What They Want. Dr. Burleson on Time is Money. annette on Time is Money. The Burleson Files are the notes, reading lists, articles, journals and general database that Dr. Burleson studies to produce the #1 Orthodontic Practice Marketing Newsletter. Copyright © 2012-2019 Burleson Seminars. All Rights Reserved. The Burleson Files.